Today I would like to share with you a project I am pretty excited about. 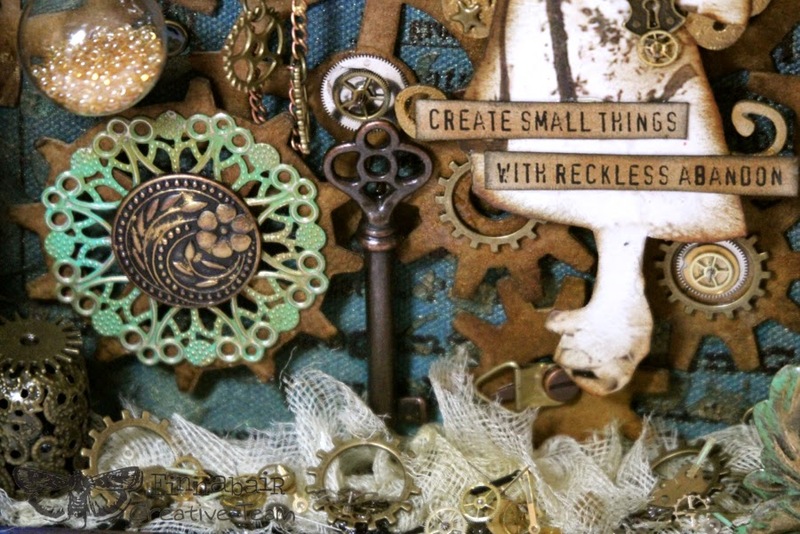 Pretty excited because steampunk style is probably my favourite crafting style. Quite a few hours went into this project, actually it was created over a few weeks, just a little bit at a time here and there. The end result I am pretty proud of, this shadow box now has pride of place on display in my craft room. As there were many many steps involved in creating this project I have condensed down into a few separate steps. 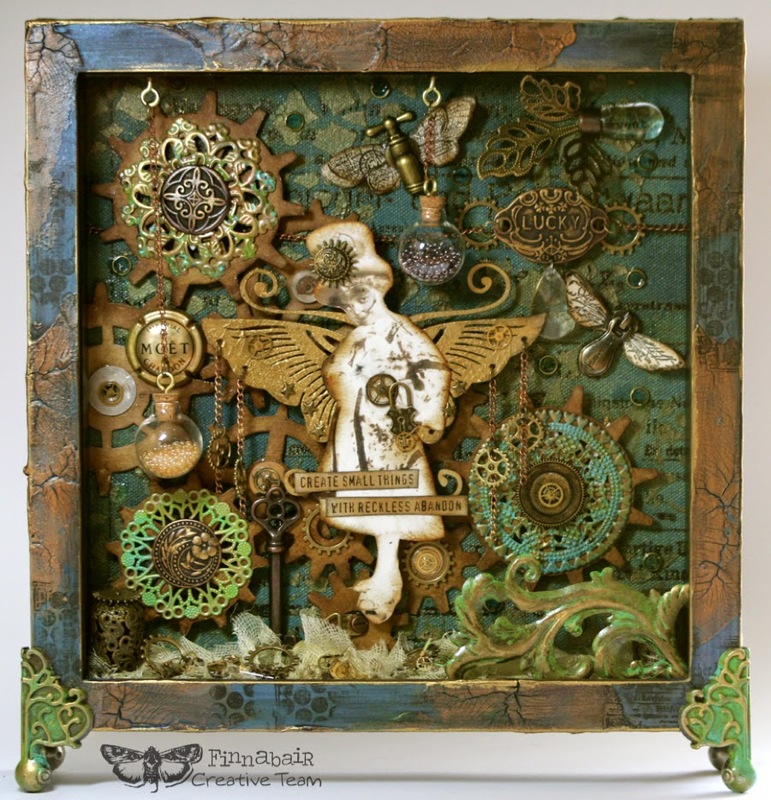 Inspired by the gorgeous finish of Linda's 'Friend's Who Love Art' clock I really wanted to try something similar on a wooden frame. My shadow box frame was purchased from Ikea (I LOVE Ikea, who doesn't?). The frame was given a light coat of Heavy Gesso (white). Copper Crackle Paste was applied thickly and allowed to dry out in the sun. 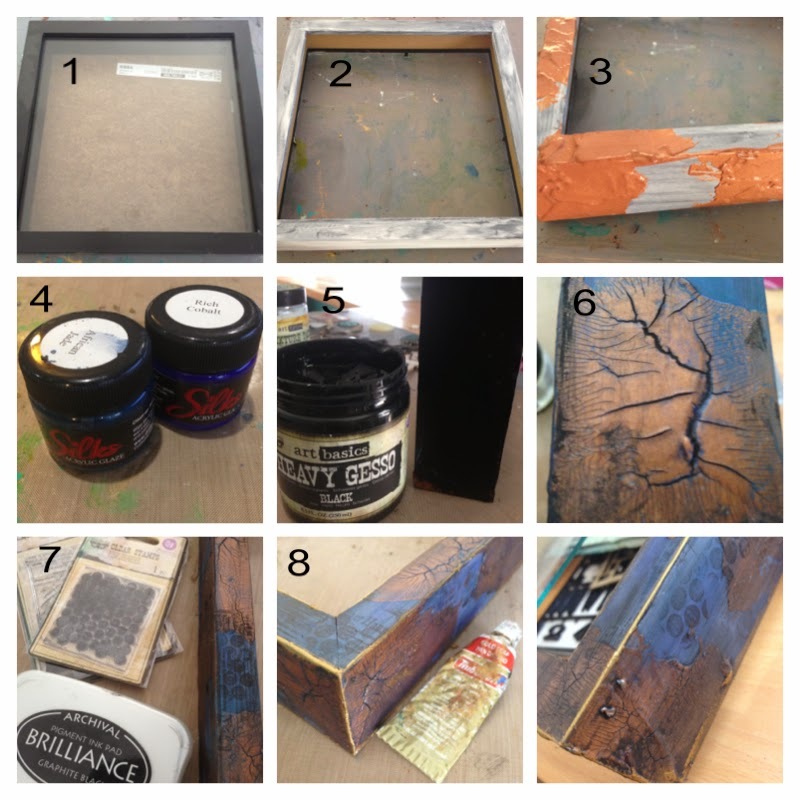 Two contrasting shades of Silks (African Jade / Rich Cobalt) were painted around the copper crackle. Heavy Gesso (Black) was applied with a paint brush over the entire frame, making sure I pushed my brush right down into all those amazing cracks. When it became slightly opaque I began rubbing it back with a baby wipe. Randomly stamp, stamp stamp the edges with Circles and Adverts stamps. Using my finger a small amount of Gold Leaf Rub'n Buff was applied to all edges of the frame. A piece of Prima Resist Canvas 'Ads' was cut to fit the backing board of the frame. 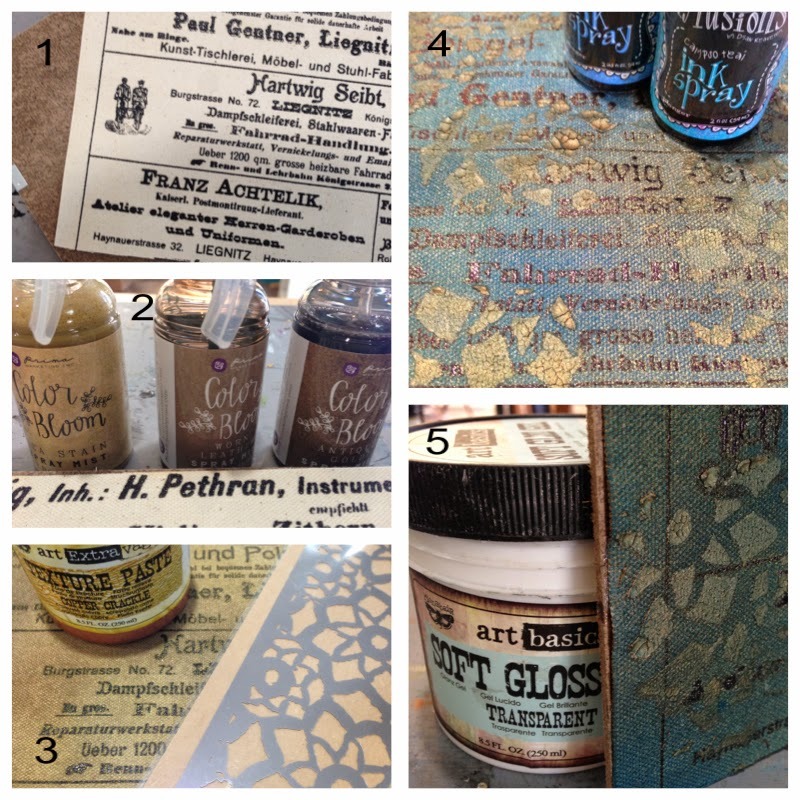 Randomly spray the entire background with Color Bloom Sprays in colours Tea Stain, Worn Leather & Antique Gold. 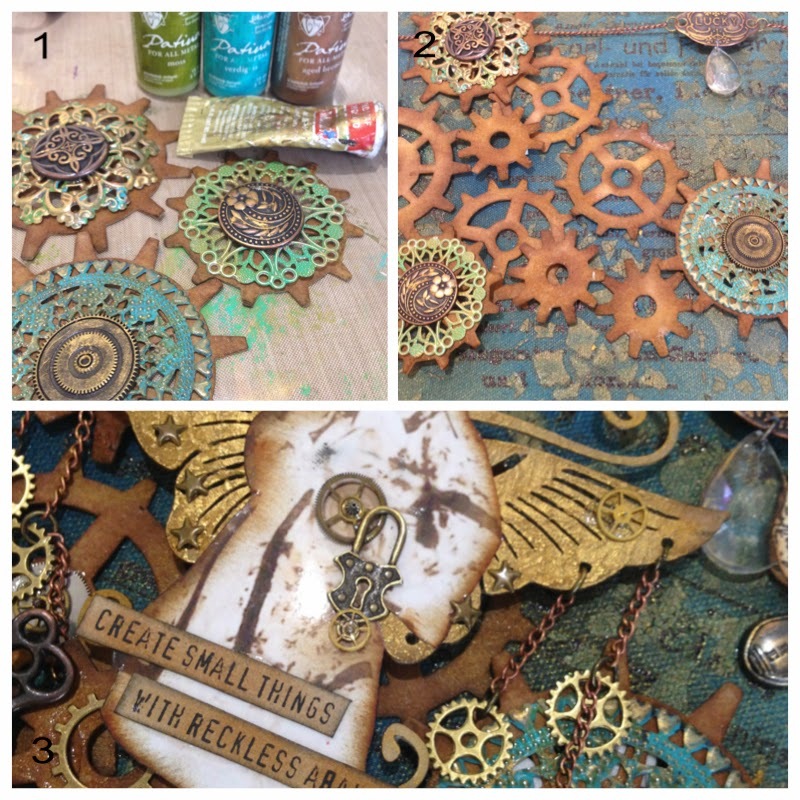 Texture Paste Copper Crackle was applied with a palette knife through the Prima Elementals Lace stencil. Once the texture paste was completely dry I added some more colour with Dylusions Ink Sprays in colours Calypso Teal and London Blue. The canvas was then adhered to the back board with Soft Gloss Gel. 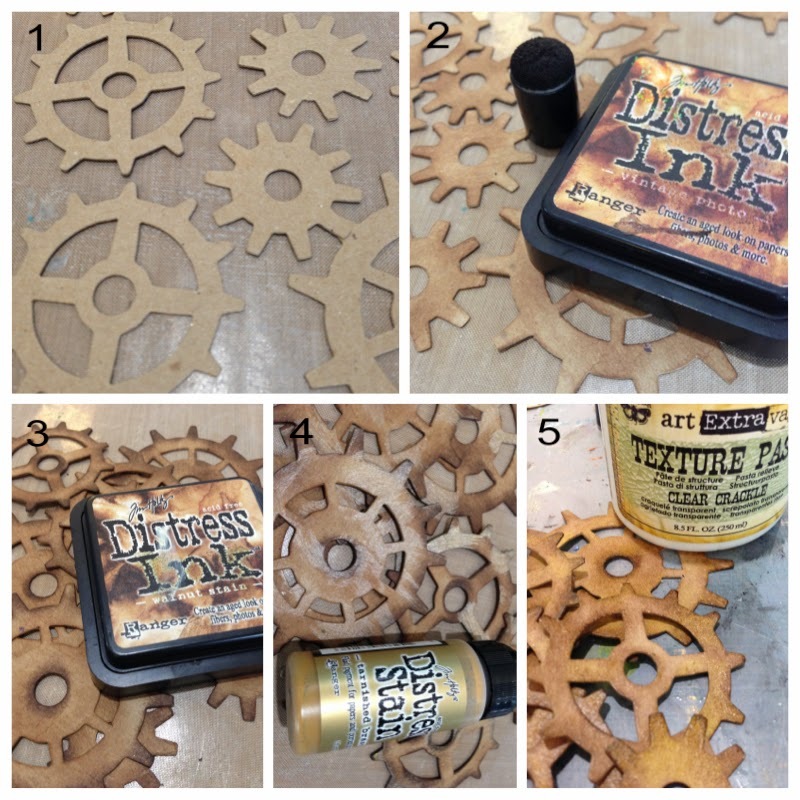 Walnut Stain Distress Ink randomly applied with dauber. A little Distress Stain in Tarnished Bronze added. Texture Paste Clear Crackle was applied quite thickly with a sponge and allowed to dry. 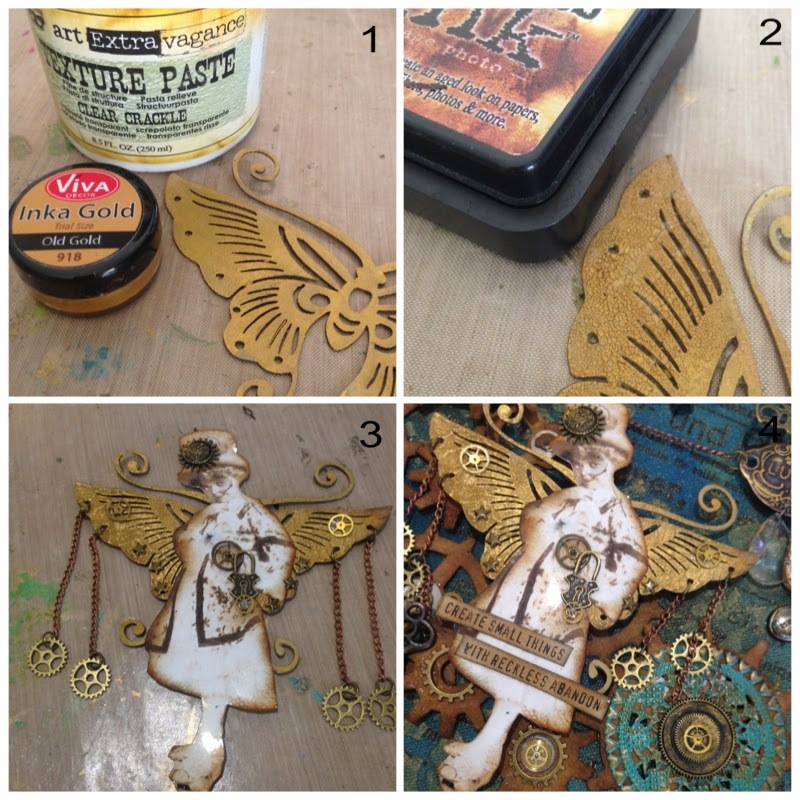 Viva Inka Gold was rubbed onto my steampunk butterfly, followed by a nice thick coat of Texture Paste Clear Crackle. With a dauber I rubbed in some Vintage Photo Distress Ink. 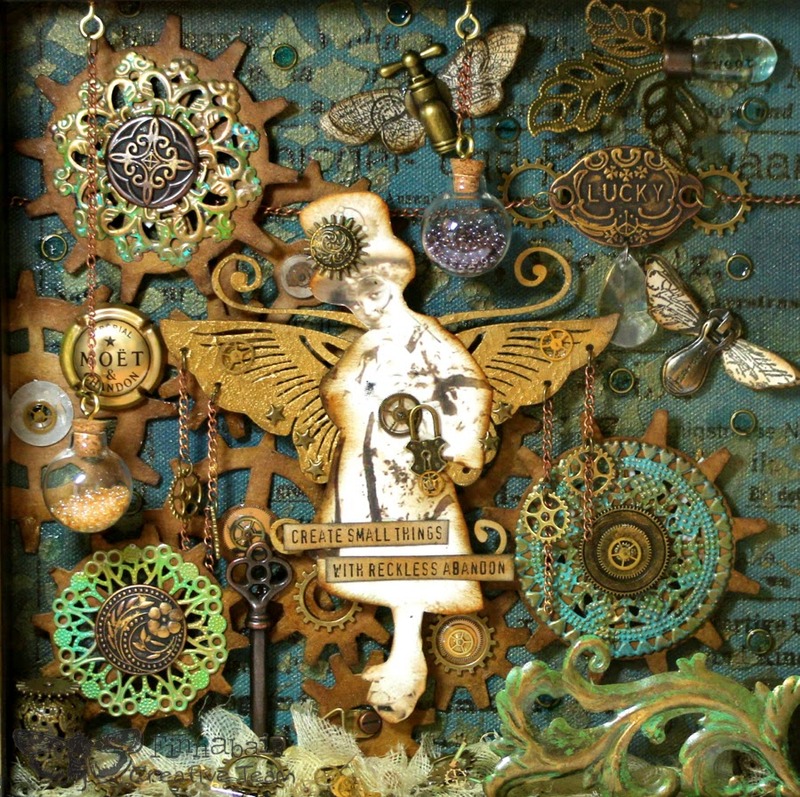 Cogs were hung off the wings with jump rings, watch parts glued to the body and wings. 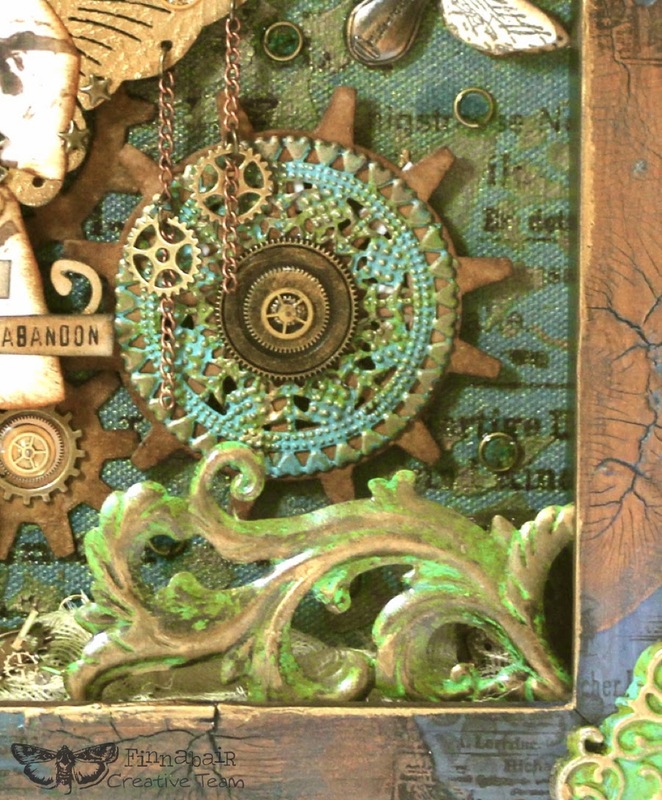 My mechanicals were coloured using Vintaj Patina in Marine, Verdigris and Moss. A little Gold Leaf Rub'n Buff was added for an extra gold touch. All my cogs were foam mounted at different levels. Now there is where it gets tricky to explain, I just kept adding and adding and adding. I very rarely know when to stop, and even now I can see little spots where I could have put even more. Jump rings glued randomly in the background, filled with glossy accents to give a wet raindrop look. Muslin was glued to the bottom of the frame, scattered watch parts were glued into place. Who can spot the champagne cap? just couldn't help myself. I understand there are many steps involved here and if you have any questions at all, I am happy for you to contact me directly for help if you need it. I wish you all a very happy and creative day. This is AMAZING! I love your attention to every little detail. What a fantastic piece of art you created. Awesome! Thank you for the tutorial. Absolutely fantabulous!! 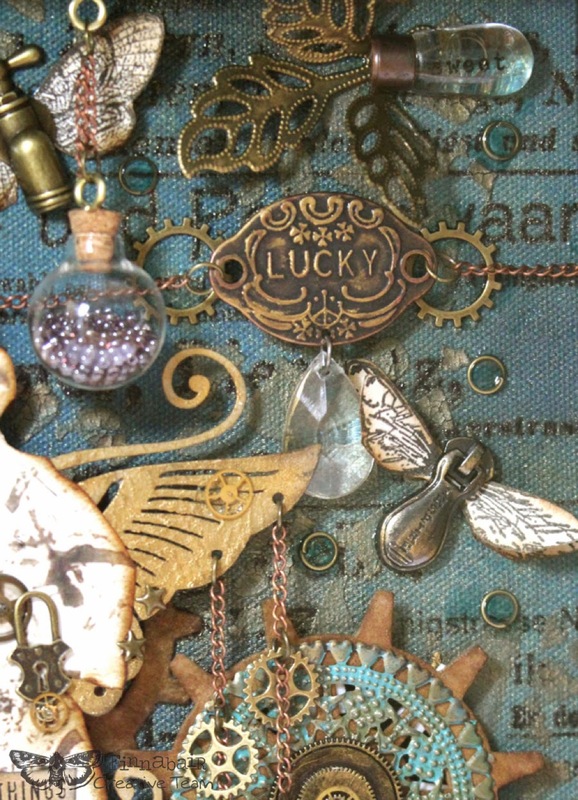 Really gorgeous piece Rebecca!! Totally amazing Art that's "over the moon." Thanks for the shout out, you're too sweet. 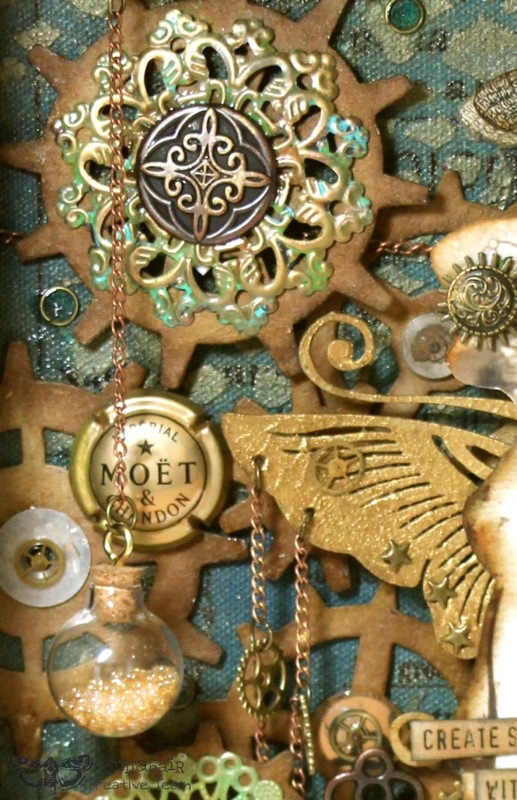 You absolutely ROCKED this Steampunk Project, my favorite type of Art. Bravo! This is so lovely. Thanks for the excellent step-by-step tutorial!